You can read Part 1 of the Eurasian Adventure here. As we emerged from the train which served as our home for six days, it took us as a while to readjust to ground that doesn’t move. Despite this however, one thing was immediately clear; that even on a dreary November day, Moscow is an incredibly beautiful city. We were met at the station by YPT tour legend Clay and our beautiful Russian companion, Anna; both of whom would be joining us for Part 2 and beyond. As we loaded all of our gear onto our backs, we followed our localMoskvich out of the station, past some scary looking skinheads, around some crabby looking babushkas, and right into a very impressive looking metro station. Komsomolskava, like many of the 196 metro stations dotted around Moscow, is aesthetically beautiful and very much in keeping with the svet style of architecture demanded by Stalin to demonstrate his thanks to the civilian population. As we walked through the station snapping pictures and getting in the way of the fast moving commuters, we approached the ticket machine with bemused faces which screamed “What the hell is this money and how do we use it? ?” Backpacks on and confusion taking over at the ticket machine, we looked every inch the travelers that we were. All that was missing was an oversized map but thanks to the fine fellows who invented ‘scroll’ and ‘zoom,’ a map these days need not be any bigger than the size of your phone’s screen. Coolness restored. Finally stepping onto the metro brought a big surprise – free wifi! Perhaps being starved of this for much of the trans-Mongolian journey made this more incredible than it really was, but it felt nice to be connected to the world again. Like I say, the trans-Mongolian is a brilliant experience but traveling through nothingness day after day makes you start to think about, and miss, friends and family. The lack of notifications and messages coupled with a relative inactivity of my Instagram account indicated to me that this longing was not reciprocated. I didn’t even get a poke. After about 20 minutes and one connection, we arrived at our destination and again emerged into the Moscow afternoon light. Turning to look behind me I could see the famous onion domes of St Basil’s Cathedral peek from behind some less startling Russian architecture. The glimpse was enough to make me forget about my social network rejection and even took my breath away a little. St Basil’s cathedral is something we constantly see in movies, pictures, and on TV but that little glimpse reinforced the reality that in just a short period of time, myself and the many of the group would soon be seeing it in its full splendor for the first time. 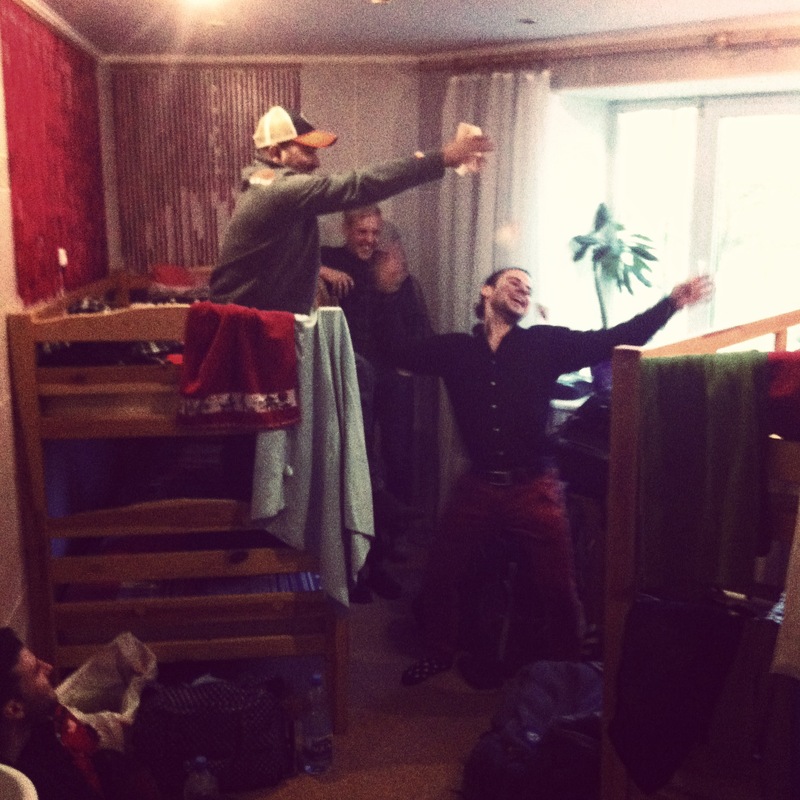 We made our way to Napoleon Hostel and waited for the rest of the group to arrive. Brummie Matt was first to arrive and having been in the DPRK with Matt in 2013, we sat in the lobby with a couple of unnecessarily large beers and caught up. Next to arrive was the delightful Yoni, who, over the next few weeks, would succeed in his ambition of teaching eastern Europeans how to party. The group now fully assembled, we headed out into the crisp Moscow evening and made our way to a 1950’s esque/ burger bar / joint which satisfied our temporarily uncultured palates. As we were in Moscow, where it just might be city law to drink vodka with every meal, we ordered a litre or two of the beautiful white spirit and gave cheers to things until there was nothing left to hope for. Incredibly the weather, as it has a habit of doing after a vodka session, suddenly became much more pleasant and we rambled our way through the streets of Moscow, and down to the infamous Red Square. 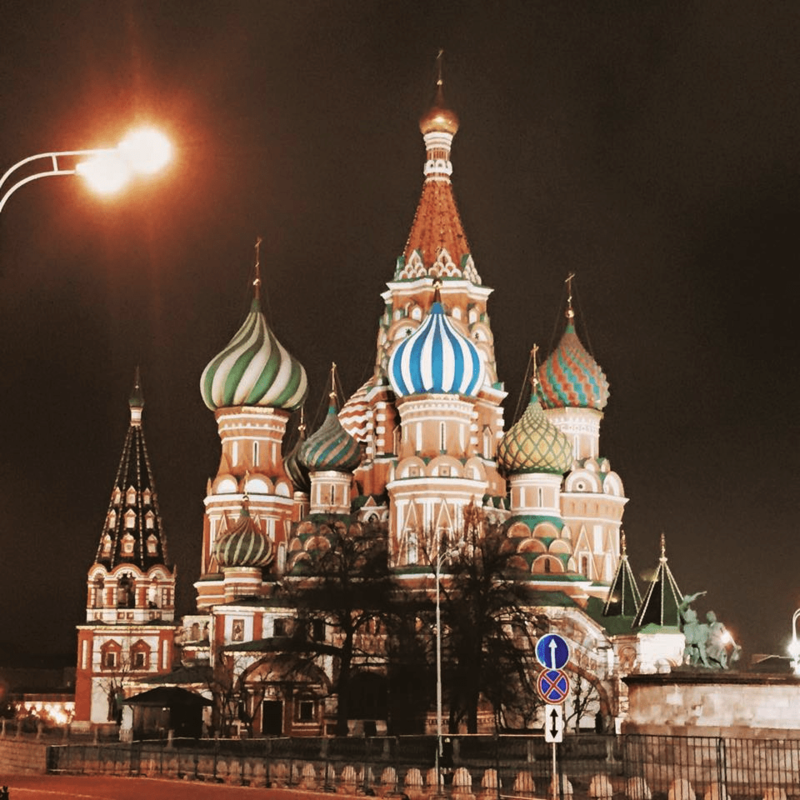 The very perfect combination of a clear night, a few shots of vodka, and a lit up square featuring St Basil’s Cathedral, Kazhan Cathedral, the Kremlin, and Lenin’s Mausoleum, made for an unforgettable feeling and one that we savored for some time. We managed to tear ourselves away from the film-like scene, in search of another drinking establishment. Our mission succeeded, and we spent the next couple of hours swigging beer from beer jars twice the size of my head. 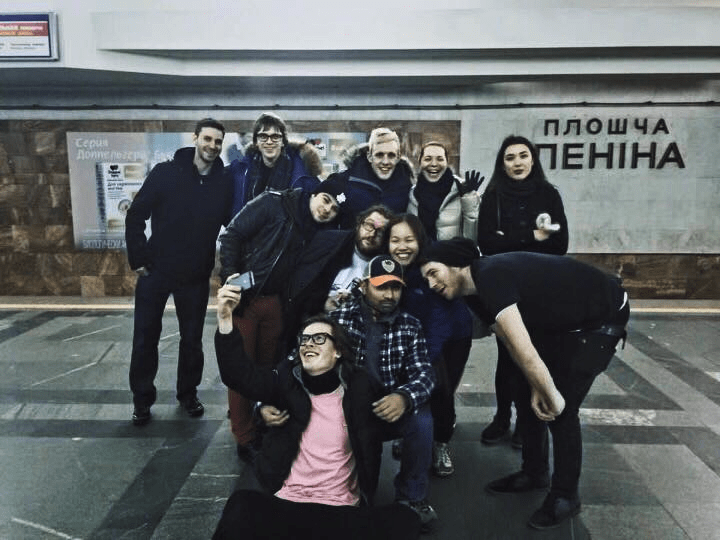 Eventually, we decided it was probably best to head back to the hostel, and so, the group meandered back to our place of slumber through the still, Moscow night. We awoke the next morning and, realizing our temporary cravings for western cuisine weren’t as temporary as we hoped, we headed to McDonalds for lunch. Such intrepid travelers. Feeling remorse for our pro-American eating habits, we decided to reassert our Russophilia by visiting the mausoleum of the most famous Soviet of them all – Vladimir Lenin. Lenin, named by Time as one of the 100 most influential people of the 20th century, has, since his death in 1924, lain in in repose whilst the Marxist-Leninist rebellions he actively encouraged have shaken world order. Whatever your opinion on Lenin or his policies, his importance can hardly be refuted and the magnitude of who this man was and the impact he had, and continues to have, on world affairs was very much on our minds as we passed through security and formed a single file into the heavily guarded tomb. 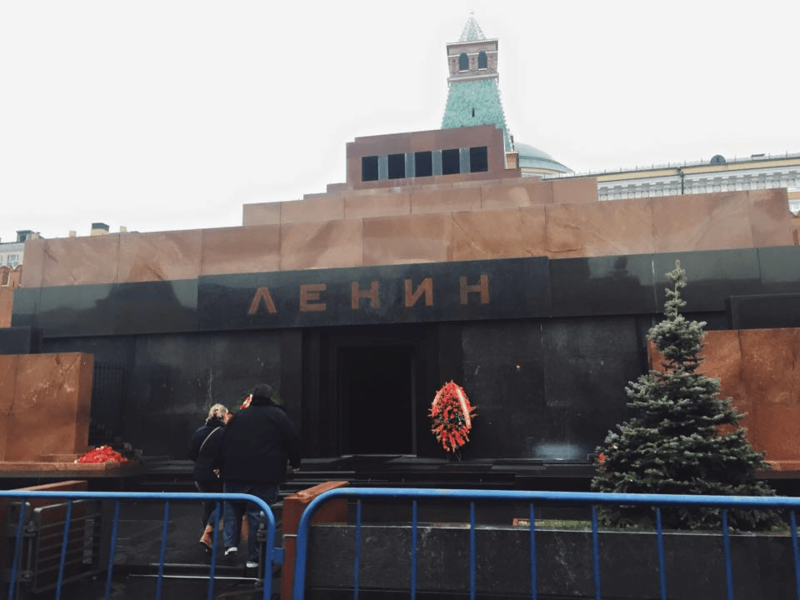 Unlike paying a visit to the Kumsusan Palace of the Sun in Pyongyang, a visit to Lenin’s mausoleum doesn’t require the visitor to bow before the body and, somewhat disappointingly, does not contain a full size yacht. And so, on the most morbid of all bucket lists, I have now seen exactly half of the six former dead leaders available to view. Chairman Mao, Ho Chi Minh, and Ferdinand E. Marcos: I’m coming for you. 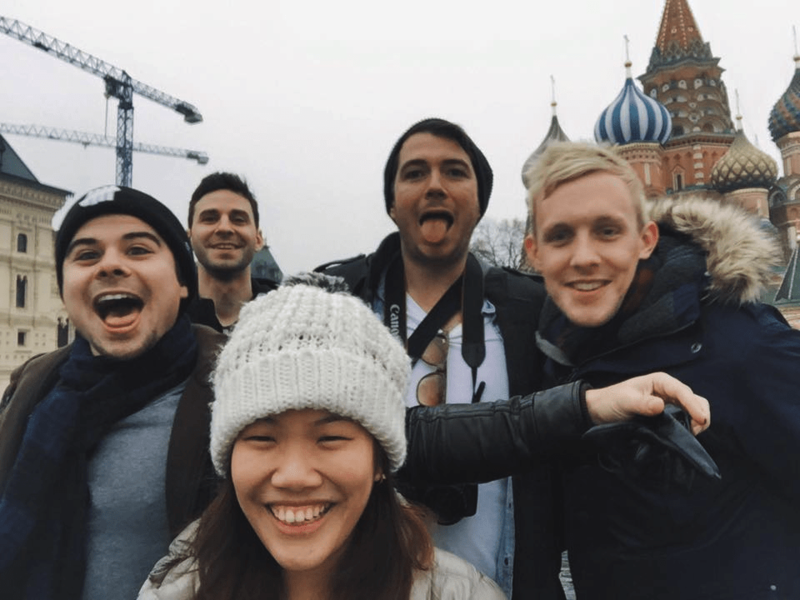 Following the extremely insightful and delightfully morbid visit to Lenin’s resting place, we took a walk through Red Square, taking silly pictures and exalting in the dreary Russian weather. 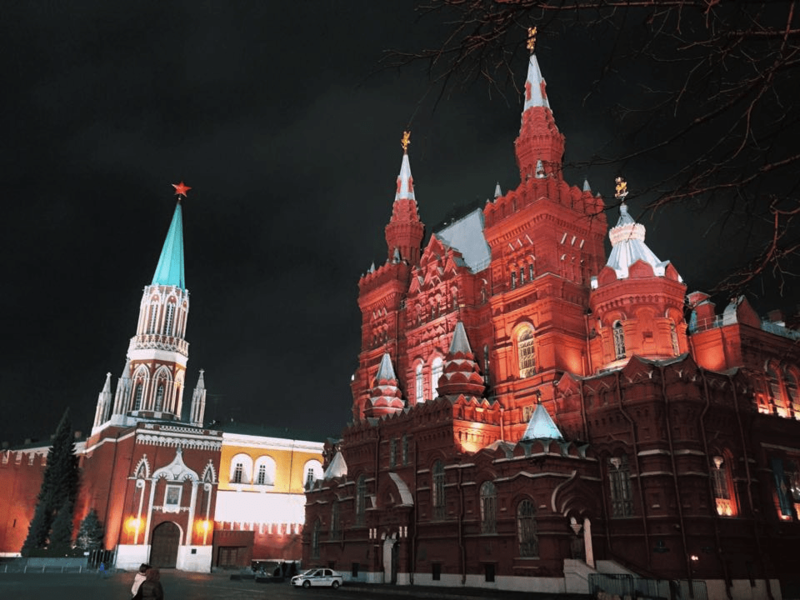 We followed the wall of the Kremlin right round past the Eternal Flame and did a full loop back to the Square were we paid a visit to the symbol of Moscow; St. Basil’s Cathedral. Following a ridiculous scenario where everyone in the group received a student discount by virtue of Gaz’s bulging wallet full of fake I.D’s, we entered and took a look around the exquisite museum. In addition to the magnificent sculptures and paintings, we were also treated to an impromptu opera singing performance which resonated majestically throughout the iconic cathedral. Feeling hungry and thirsty again, we headed back towards the direction of the hostel but not without first making a stop at a pro-Russia / pro-Putin t-shirt shop. It turned out to provide much enjoyment for the group and a few people were happy to part with their rubles and jump on the wave of patriotism currently advancing across the entire country. After a long lunch which took the form of authentic Russian fare and of course, traditional Russian liquids, we headed back to the hostel where some people were happy to relax for the evening. A group of us however used this spare time to hop on the metro and head out to Cosmonaut Park; a park that celebrates the victories of the Soviet space program. Unfortunately the Cosmonaut Museum itself was closed but we still had a great time walking around this beautiful park mingling with Muscovites and reveling in the evening atmosphere. The park even has a roller coaster which is in such disrepair that I wouldn’t be surprised if Lenin himself had gotten the opportunity to ride it. Somewhat less terrifying however is the ferris wheel which allowed us to obtain great views over the lit-up Moscow skyline. together, the whole group reassembled We made our way to the railway station to grab some dinner, stock up on beer, cheers some vodka, and hop on the 22.24 to Minsk, Belarus. If ‘travelly’ was a word it would probably be explained by an overnight train from Moscow to Minsk. There is something so fantastically random about going to Belarus; a perception backed up by the fact that it nestles between Grenada and New Caledonia at number 159 in the World Tourism Rankings. For such a beautiful country with an extremely friendly population, it is disappointingly underutilized by the traveling world. The train journey began with the entire group drinking and chatting but, as often happens, one by one we faded. That is, until there were three. Yoni, Clay and Gaz flew the flag for YPT by staying up the entire night, drinking beer, knocking back vodka, smoking an untold amount of cigarettes, chatting with a gentleman who claimed to be in the KGB, and basically showing Russia how to party. I would awake every so often to Gaz, not so much speaking Russian, but rather describing all of our future stops in a Russian accent (think ‘Kievski instead of ‘Kiev.’) Owing to the fact that the top bunk I had acquired was worryingly short of the protective guard all others had, I was pretty happy when we finally reached Minsk at absurd o’clock. We bundled our things off the train, had an obligatory cigarette, attempted to decipher signs, and made our way to the currency exchange. There is something very confusing about changing money and receiving denominations of both ‘200,000’ and ’50’ in the same pile. How on earth could a fifty be worth anything if 200,000 was relatively easy to spend? We quickly found out that with access to the toilet costing 15,000 Rubles, the 50 was in fact worth almost nothing. This didn’t however stop us throwing them all in the air whilst listening to something called ‘hip hop music’ during an event which Freddy dubbed “The cheapest rap video in history.” Confusion subsiding, we all jumped in taxis and sped off to our hostel but finding it too early to check in we did the only thing one would would think of to do on a Monday morning in Belarus – go to an irish bar. Drozhi United Irish Bar, to be exact. We arrived to find that neither the customers nor the staff spoke a lick of English and that the menu was entirely in Cyrillic with no pictures. After what must have appeared to others as being a very animated game of charades, we managed to order some breakfast, and through the universal gesture of pointing, successfully received locally produced beer. Feeling full and our thirst sufficiently quenched, we re-emerged onto the mean streets of Minsk and headed back to the hostel to freshen up. Looking incredible, we all headed to the Museum of the Great Patriotic War. The Great Patriotic War is the name given by former Soviet states to the period from 1941 – 1945 of what we call World War 2 and encapsulates the Soviet struggle against Nazi Germany. It is estimated that during this period of time, a staggering 25% of the Belarusian population lost their lives as a direct or indirect result of the war. In keeping with this, the Museum, through dioramas, exhibits, paintings, photographs, and artifacts, excellently brings to life the atrocities of the war. Following the museum, we made our way back out into what was by this stage, a bitingly cold but dry, Minsk evening. We followed the road for about one kilometer and made our way to Troitskoye Predmestie (Old Town); an area of the city that contains beautifully lit up buildings which afforded us great photo opportunities. 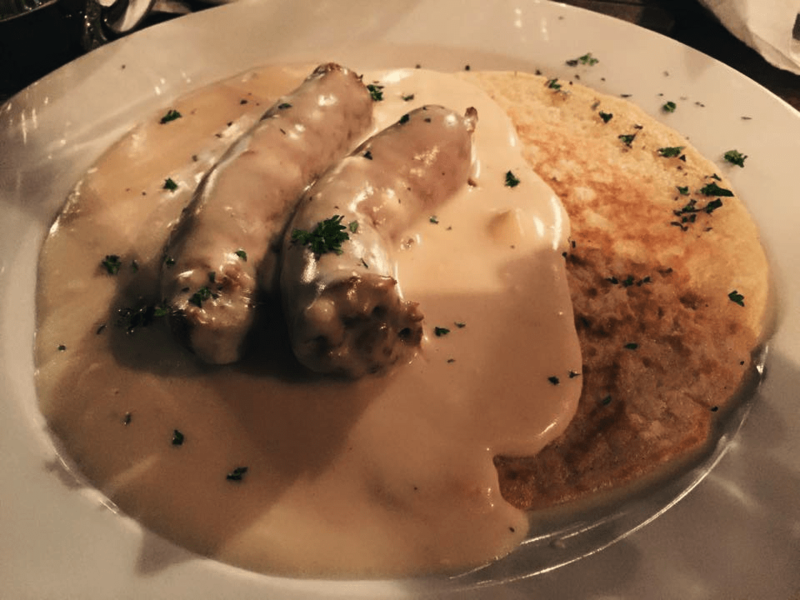 Feeling ravenous, we found a very cosy restaurant that served up local delicacies and, following our trip to the Irish Bar for breakky, we felt we should get our teeth around some authentic Belarusian cuisine. We were certainly not disappointed; it was incredible! Following dinner, we invested money in the local economy by purchasing a few liters of Minsk vodka and, as often happens, this gave us itchy feet to try out some new haunts in town. Gaz called up a couple of extremely hospitable and incredibly friendly Belarusian friends of his who seemed more than happy to show us their city’s nightlife. They took us first of all to their beautifully well appointed, high ceiling apartment in downtown Minsk where we chatted, had drinks, and listened to music. the like. Me, being about as cool and composed as a cow on roller skates, used my credit card to get sufficiently tanked and, having done so, spent the night dancing with, and sometimes getting ignored by, beautiful Belarusian models. The night is basically one big fun filled haze and everyone got home safe. Some even had a companion with them. Eh Matt? My night ended with myself and Yoni sitting on top of a delivery truck, eating pizza and talking about who-knows-what but rather more disturbingly, my next day began with me cuddled up beside Gaz on a tiny single bed. After the previous nights debauchery, we decided to engage in something a little more cultural and so, after eating a pizza lunch from the very handy pizzeria opposite the hostel, a few of us jumped on the local bus to the not-so-local destination of the Dudutki Museum which is around an hour and a half away from Minsk city. The museum aims to demonstrate the history and culture of both the people of, and places within, Belarus and whilst there, we were able to see the old traditions of blacksmithing, pottery and weaving whilst sipping on some vodka and sampling the local cuisine. To be entirely honest, although it did provide some insight into the more rustic, rural and traditional side of Belarus, the museum itself is a little flat which makes me think a new excursion might be in order for next year. 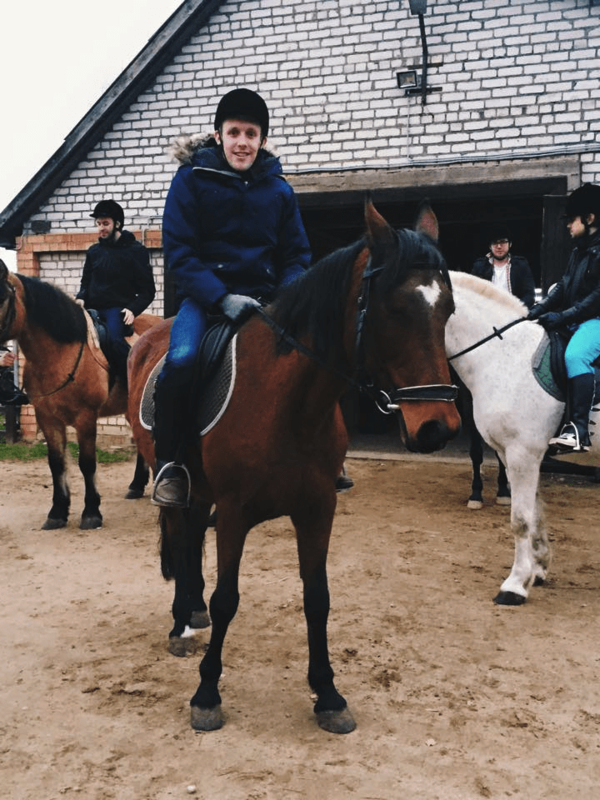 That being said, as underwhelming as the museum may have been, we did partake in some thoroughly enjoyable horse riding at the farm. The stable master took us on a trek around the fields and through the woods and although we certainly looked the part with our chaps and get-up, this didn’t really translate into any kind of equestrian aptitude. Culture day over, we headed back by local bus to Minsk central station to meet up with the rest of the group, eat some dinner, and prepare for the long Kiev-bound train journey ahead. We all obtained the train necessities which now constituted vodka, beer, cigarettes, and very little else. We all jumped on the train and, as expected, a party began as Freddy’s bluetooth speakers and banging tunes once again emerged from his backpack. At this point and at this rate, I wondered how the hell my body would endure the entirety of this trip. But here I am, typing away, testament to the body’s incredible power to not die through even those worst of hangovers. As we approached the Belarus / Ukraine border we began to wind down the good times so as not to piss off the Belarusian immigration officials who we had assumed would be somewhat lacking on the ‘good crack’ vibe. This turned out to be completely wrong; just like pretty much everyone else we had encountered, Belarus Immigration were incredibly polite and helpful. I had been secretly shitting myself because my Belarusian visa was actually for the wrong departure date but instead of sending me to Siberia for some logging punishment as I had envisaged, they gave me a hearty, russian sounding ‘no problem!’ and sent me on my way to Ukraine.